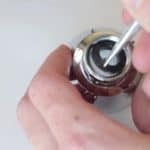 If you are familiar with Drano and Liquid Plumr and are not quite sure which one will work for your plumbing needs, you are in the right place. 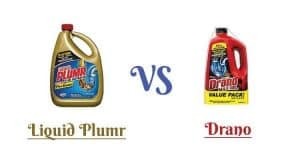 Liquid Plumr and Drano are powerful, quick acting drain cleaners that will help you clear your drains of gunk, soap scum, hair and other organic matter. 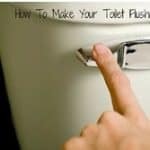 They work to dissolve tough clogs and increase the water flow in your drains. Both of them are safe to use with most types of plumbing material like PVC, plastic, and copper. They are user-friendly, versatile and affordable and can also work to clear septic tanks and garbage disposals. Other products in both ranges include Drano granules for kitchen clogs and a foaming gel. Liquid Plumr comes in both slow flow and heavy-duty gel formulas. To help clear slow-moving or tough clogs, improve water flow and protect your plumbing at the same time, Drano and Liquid Plumr are two great options to consider. Liquid Plumr uses powerful triple action strength to clear fully blocked drains quickly. Pipe Guard capability protects your pipes with a coating while clearing the drains. Liquid Plumr ranks among the ten best-selling Health and Household products. It also rates in the top 100 products in the Household Cleaning Drain Openers list. The full-strength clog cleaner powers through fully blocked drains. It’s good for slow-moving drains, septic tanks, and garbage disposals. Liquid Plumr employs triple action formula that moves through the stagnant water to unclog tough drains. 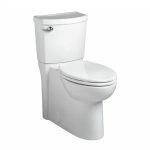 Fights drain odors and help to improve water flow. The gel leaves a repellent shield which reduces grime build-up. It works swiftly and effectively to clear clogs. Using the gel with garbage disposals and septic tanks is safe. Pour about 16 ounces into the drain. Let it sit about fifteen minutes or longer if needed. Flush down with hot water. For best results, use Liquid Plumr regularly as part of your monthly plumbing schedule. 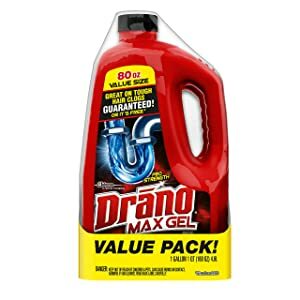 Drano is a gel-based drain formula that works quickly to clear blocked drains and increase water flow. 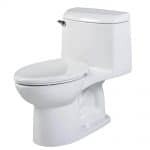 Using Drano with most types pipe materials and septic tanks is safe. Drano cleaner ranks #1 in the Health and Household drain openers and in the top 100 best-selling drain cleaning products. Drano’s powerful action works fast to rid your drains of soap scum, hair and other gunk in your plumbing systems. It’s a thick,fast-dissolving formula that cuts through tough blockages. Added substances protect your plumbing from corrosion. It’s safe to use in garbage disposals, septic tanks, and other plumbing materials including plastic, PVC, or metal. Drano has no phosphorous and will give off no toxic fumes if left in the drain overnight. It works through standing water to clear clogged drains. It improves water flow in sinks, showers and other drains. Using Drano with most types of plumbing materials is safe. Drano gel can also work to unclog garbage disposals and septic tanks. It dissolves tough clogs including hair, soap scum build-up, grease, and oil. Never plunge after or while Drano is inside the drain. Protect your hands and be careful not to splash. Open the bottle carefully and avoid applying too much pressure. Press down carefully on the lid with the palm of your hand. Turn the cap to the right to unscrew. Don’t squeeze the container or splash the liquid. Clean up any spills promptly. To avoid toxic fumes the cap by pressing on the cap to screw it on securely after use. Pour about ½ the bottle or at least 32 ounces slowing into the drain. For fully clogged drains, pour the full contents of Drano into the drain. Let the cleaner work through the drain for at least 15 minutes to half an hour. If the first application does not work, insert another portion to the drain as needed. Let it work through and flush with hot water. To clear garbage disposal clogs, pour at least ½ bottle into the drain. Let the formula sit for 15 to 30 minutes to work through the clogs. If clog remains, do not switch on the disposal; the remaining Drano may splash up. It may be better to call a plumber. When the drain clears, follow up by applying Drano every month to help keep the drains clean. Chemical Composition Contains phosphorus instead of chemical sodium silicate. Slightly higher foaming action Drano contains chemical sodium silicate instead of phosphorus. Produces less foaming action. 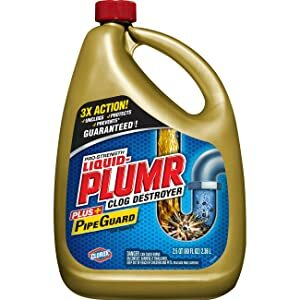 Both Liquid Plumr and Drano are good options to help clear clogged drains. They work fast and powerfully to dissolve gunk, grease, soap scum, hair, and other organic matter. 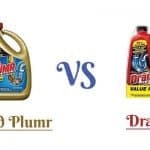 Both products contain similar chemical ingredients, except for one addition in Drano While Liquid Plumr seems to work faster, Drano appears thicker and has fewer chemicals.